A little fox discovers the wonders of the world around him in this exuberant picture book that celebrates the seasons and the relationship between a parent and child. When Mama Fox tells her new baby that it’s time to go outside for the first time, he isn’t so sure. 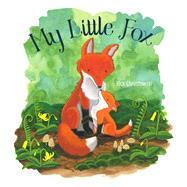 So Mama promises to stay by his side as they tumble though Little Fox’s first year of life, a year spent splashing in puddles, trying new foods, leaping in leaves, and snuggling in snow. And then, before long, Little Fox is all grown up. But is he ready to go off on his own? With sweet rhyming text and vibrant illustrations, Rick Chrustowski tells a tender story of parent-child love and how wonderful—and wistful—it feels when a little one leaves the nest.